Starting at 12 years old, I began reading Mad magazine. 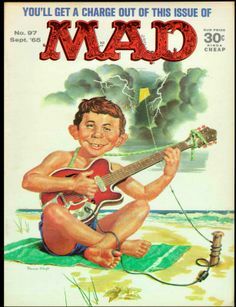 Every issue had the “What, Me Worry?” kid, Alfred E. Neuman, on the cover with his gap-toothed smile. Every issue of Mad magazine contained “assorted rubbish from the usual gang of idiots”, which was the publishers’ slogan. There were other humor magazines such as “Crack’d”, “Sick”, and “Panic”, but Mad was always consistently the funniest. I was so dedicated to Mad, I’m sure the magazine shaped my entire attitude toward life. They still sell Mad magazine but most places that sell magazines are way too respectable and reputable to carry something so smart, creative, and anarchic as Mad magazine. Today, we also do have “The Onion”, a fake newspaper with outrageous headlines like “Pepsi to Cease Advertising”. Most of the articles in The Onion are more relevant than those in the real newspapers. I’ve noticed that after the first few humorous pages, “The Onion” has some of the best reviews anywhere. After college I mostly switched to humorous novels instead of humor magazines. Kim at Reading Matters recently listed the ten bleakest novels ever. Most of these novels were very dark. Now, as an antidote, I will print my personal list in no particular order of the funniest novels ever. 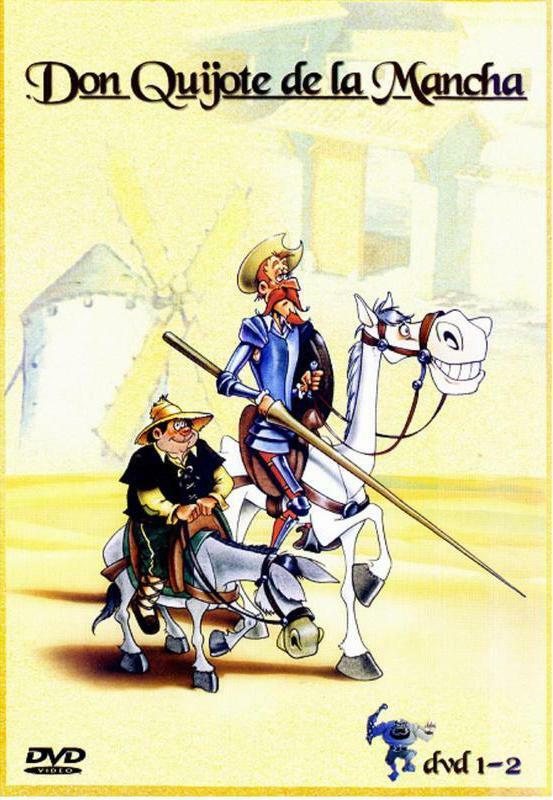 * Don Quixote by Miguel de Cervantes “a hopeless romantic” or “romantic and hopeless”? * The Groves of Academe by Mary McCarthy Why is college so funny? * Pictures from an Institution by Randall Jarrell Is humor academic? As you can see, no writer appears on this list twice. Which writer came closest to appearing twice? It probably would be Evelyn Waugh whose “The Loved One” is a fall-down hilarious putdown of the funeral business. Honorable mention also goes to Peter De Vries who wrote many humorous novels including “The Tunnel of Love” and *The Tents of Wickedness”. I’m sure there are some great humorous novels I’ve missed. I want to know what I’ve missed. What humorous novels should I also include? If Confederacy of Dunces is “the New Orleans book,” this is the New Mexico book. When a down-on-his-luck Hispanic handyman decides to illegally irrigate his property to grow some beans, the entire town prepares for a race/class war. A large cast of comic characters on a collision course… you get the idea. I’m guessing that fans of Kurt Vonnegut, Douglas Adams, and Tom Robbins have already annoyed you. Regardless, you’ve got a good list going. Thanks. Well, you say you’re a Graham Greene fan so you’ve probably already encountered it, but “Our Man in Havana” is right up there. I also think Jane Austen is hilarious. I definitely read “Our Man in Havana”, thought it was great, but somehow did not classify it as a humorous novel. That’s happened with quite a few books. I did not classify them that way at the time, but looking back they were humorous. Another great blog post. I shared this on my Facebook – you should think about adding a “like” button to your blog. Wow, I was fortunate to stumble across this site when I was looking for some info on Bing! Keep up the great work! A cross between Candide and Family Guy sounds like a riot. For God’s sake, what made you include Oblomov by I. Goncharov in your list of humorous novels? – It is one of my favourite novels, I read it thrice, but I always treated it as a serious study into the heart of a typical Russian character. I have never heard of any Russian literary critic treating the novel as humorous. Many of them were critical of Oblomov as a man. We have even a pejorative term in our language – “oblomovshchina”. I guess you had Goncharov’s Simple Story in your mind, which compares well with any of works by O. Wilde, and which I do recommend to other readers. Nevertheless, I find your viewpoint rather refreshing. I googled ‘Oblomov Humorous’, and there are a lot of Western critics who treat the novel as humorous. It looks to me that Russians treat ‘Oblomov’ as a serious character study, while Westerners treat a guy that lazy as a joke. I really like Oscar Wilde’s work, so ‘A Simple Story’ might be something that would interest me. For humorous writing one of the most hilarious things I’ve ever read is O Henry’s short story The Ransom of Red Chief. For me it was completely laugh out loud don’t-read-in-public-funny. The other thing I remember reading with a similar outcome was the first chapter of Bill Bryson’s Notes from a Small Island. I’ll never forget the tomato at breakfast being described as a blood clot or his ‘interview’ with the B&B owner after which he agrees to find other accommodation. Enjoying your blog… many thanks! I haven’t tried much O Henry yet. I’ll keep ‘The Ransom of Red Chief’ in mind. And I still want to get to Bill Bryson about whom I’ve heard good things from my wife. I’m also happy you are enjoying the blog. Thanks! Humour (and satire), in my view, is probably the best way of getting a message across, without being didactic. Like you say about most articles in The Onion being more relevant than the real ones. It is also difficult to create humour. My suspicion is that humour (and satire) makes many people squeamish as many uncomfortable truths are brought out which is why it is consigned to being a “genre” and not whatever we may mean by “mainstream”. Yes, it is extremely difficult to be intentionally funny with the danger being getting thrown off the stage. I think the good comedians always have an element of laughing at themselves that is winning. If I laugh at my own shortcomings and mistakes, it is much easier to take when I laugh at other people. There are many novels that aren’t outright humor but have that element of laughing at oneself when younger. I have read “Cloudstreet” since I prepared my Humor list. I loved “Clodstreet”, and thought it was extremely humorous even though I am not from Australia. Here is my link to my entry on “Cloudstreet”. It is a great book. this subject, it may not be a taboo subject but generally people do not speak about such subjects.